Combine elegant style and practical functionality with the Mission Display Bookcase with Seedy Glass. 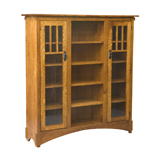 This solid wood bookcase offers a beautiful way to organize your books and collections. The Mission styling of this cabinet has simple lines, accented by the parallel mullions in the glass doors. Pictured in cherry with FC-106 Acres stain.